The first time it was in January 1974. 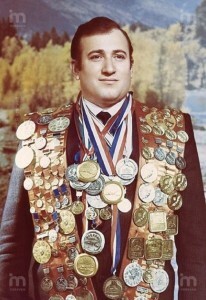 This day Shavarsh Karapetyan returned from the sporting base of Tsaghkadzor (known for all generations of Soviet swimmers!) to home in Yerevan. In the bus there were more than thirty passengers. On the steep slope its driver noticing a problem, got out of the cab, opened the hood and … Suddenly, the bus pulled away and rolled towards the abyss. Inside – panic, to Shavarsh, sitting closest to the drivers cab, remained a small moment. And he could do it! With the elbow he broke the glass that separating the cab from the passenger compartment, reached for the steering wheel and twisted it sharply, sending the bus from the abyss to the mountain. The bus froze, standing across the road. They say that double shell is never fall in the same funnel. But the fate would have continued to experience to strength the champion’s defence. In 16th of September 1976 Shavarsh with his brother Kamo and his coach Liparit Almasakyan were jogging in the morning. He already had covered 21 km, when he saw a terrible picture. In front of him an overflowing trolley lost its driver’s control, broke through the guardrail and fell from the embankment in the Yerevan Lake. The bus immediately went to the bottom — no one was able to get out from the lake. It seems that God himself sent to help the this perishing people a champion-diver — no one else in the World could not, probably, make at the time what was under the power of Shavarsh. Even now, so many years later, in a comfortable Moscow’s apartment from his story quietly run shivers down your spine. He dived over and over again, already like automate, in his fading consciousness throbbed only one thought: people are there! Just a few minutes before, full of strength and agility, but now exhausted, his body rugged by fragments of glass refused to obey him, but again he barely taken a sip of air, plunged into the cold, dark water. In all, he pulled out of the water 27 persons, 20 of them managed to return to life. I wonder what happened to them now after a complete life? Do they remember their saviour? But I ask Shavarsh about something else: do he dreams about the people that he brought back from the other side of the world? That fateful day put the champion him-self on the brink of life and death. Severe pneumonia complicated by sepsis. One month and a half he was unconscious. When an inflammation in the lungs formed adhesions, every breath was given with difficulty. But also at this time took place a miracle — he scrambled from his situation! Tempering and iron will help Shavarsh, he even returned to big sport and was able to set a new World record! Unbelievable, but after a while he again saved the people at this time from the fire. Multi-storey building was burned and also saved there a lot of human lives, back receiving many injuries and burns. Do you think this is mystique or fantasy? Shavarsh never felt himself a Hero, and the newspapers written about his feat just six years after it. Then an order was given to him by Soviet government — «Order of Honour», International Olympic Committee awarded him by a badge «For fair play»… Though, if for such people to feel sorry “Stars of Hero”, to whom do you want to give them?